With the constant support of our dexterous workforce, we are able to come up with best grade Micro Soldering Iron. Offered soldering iron is widely used for joining the components and electrical wires in devices. 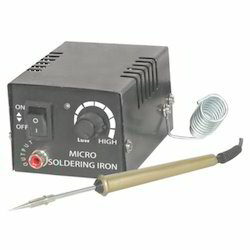 We provide these soldering irons in varied watt capacities as per the different jointing needs of the customers. While manufacturing these soldering irons we keep in mind the established quality standards of the industry and make use of optimum quality raw material. With sincerity and hard work of our professionals, we have carved a distinct niche for ourselves in this domain by offering high grade Micro Soldering Iron. The demand of offered soldering iron is high as it is in-line with the universally accepted quality standards of the industry. To ensure the same, we make use of supreme quality raw material in the manufacturing process of this soldering iron. Looking for Micro Soldering Iron ?